I have posted a few pictures of different types of ferns, such as the licorice fern or the sword fern. This is the maidenhair fern, also known as the angel hair fern. It is most common in damp areas of the forest, like along streams or growing out of damp rock faces. Very pretty with the rain drops. Great composition and love those drops! Thanks for stopping by to visit. Not only am I returning your visit but I'm now following you. 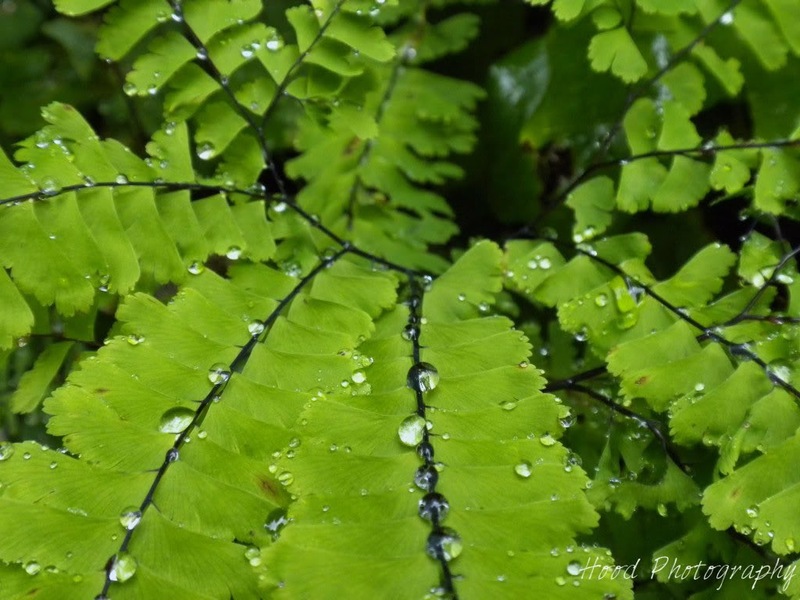 Lovely photo's of the Maidenhair Fern. It's so nice to see photo's of ferns as I think they are passed by as just another green thing growing along the woods..Ferns are beautiful. I love this one and I must confess, I know there are lots of beautiful ferns but I dont know them by name. Wonderful photo you have shared. Wow lovely take! We also have this fern in the property and the ferns are starting to grow beautiful now with the constant rains. Hello Hood Photo! It's Linda from "Linda's Lens." Thanks for stopping by and leaving a comment on my blog. I'm your newest follower. Lovely photo, my Mum grows several varieties of maiden hair fern, they look wonderful. Thank you for stopping by my blog! I love your shots! If we ever get any rain I want to try out the rain drops capture. Love it! Especially the symmetry of the drops ... just beautiful. Hi there - I like the black stem down though the centre of each frond, and the way the water gathers there. Hi Betty, thanks for stopping in to see my blog. I can see we have a lot of common interests. Your pictures are beautiful and you certainly have beautiful surroundings to work with. I am following you and look forward to future posts.